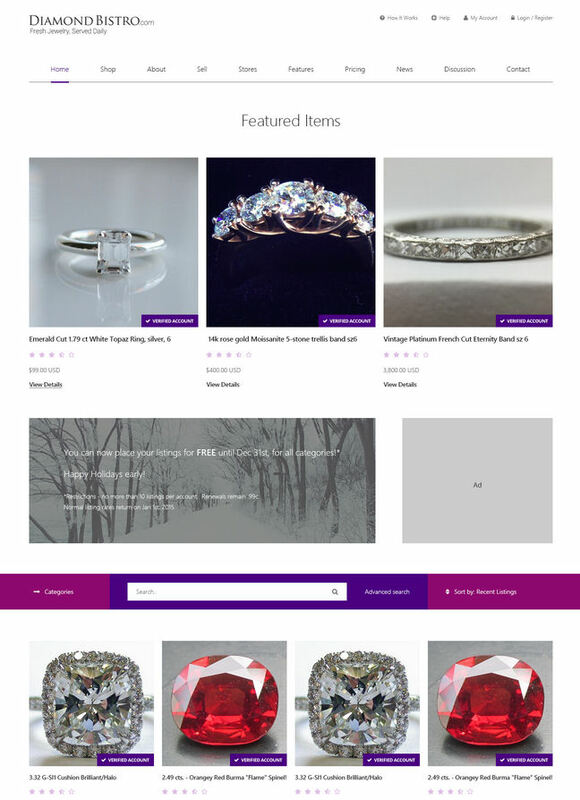 We've been working since last Fall on building a much newer/better/improved DiamondBistro platform and wanted to show you a preview of the design changes. Note that it looks 'extra' long above because I had to shrink the width to minimize the size of the screenshot. This is just the current working design so there will likely be more changes, but wanted to show you so you can see what's coming soon! I like it! Is there going to be a more detailed search function built in? For example if I want to search for all rings listed as an 8? Are more things going to be required? Such as requiring that ring sizes, type of gold etc be entered? What about payments? It is kinda risky to pay using the gift option yet most sellers demand it or ask that you pay more than the asking price. I do not agree with this. That should be added to their asking price before hand. Seller fees are just part of business IMO. Small shop to major international retailers, fees are paid. I know my opinion isn't popular but I think there should be a few more clear cut rules added to the site. well, i agree that sellers shouldn't ask or require buyers to use the "Friends & Family" option in Paypal or require buyers to pay the fees. that's against the Paypal rules, even. Im trying to message a seller on db and it doesn't let me, any other way to get ahold of them? May I ask, whatever happened to the new layout? 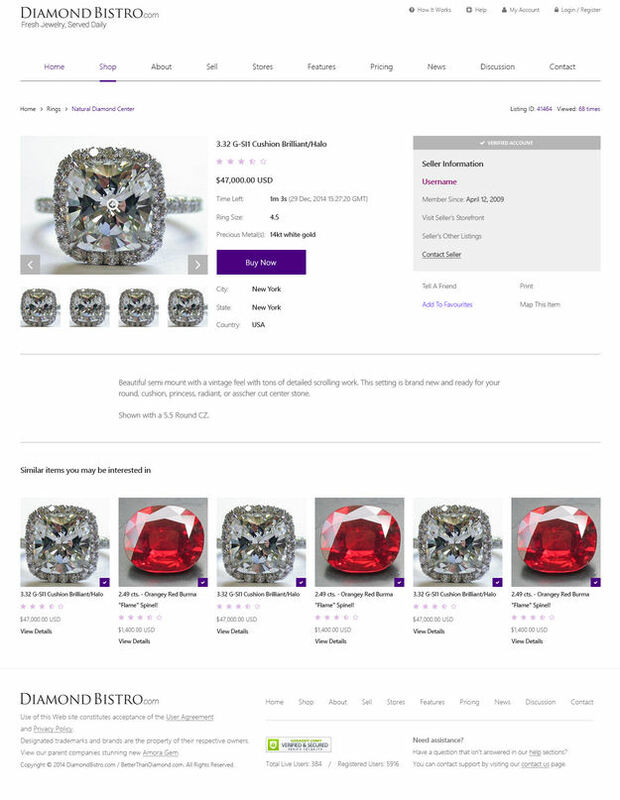 Two-thirds of the current DiamondBistro homepage is essentially useless to users, as the Popular Listings and Recently Sold Items have never been updated. Sure- we spent a lot of money on the new site (close to $20K) and ultimately realized it was still going to need a lot more work to be what we wanted it to be and be fully ready for use. At the same time, we realized that we'd way overspent given the tiny ad revenues the site generates (barely more than the hosting cost per month), and that it was never going to pay back to continue. Thus, we had to stop and did a very minor upgrade to the existing site and really have not had the resources or motivation to do anything more with it. Unfortunately after 8+ years it's quite clear that DB is going to be breakeven at best, and so we're not going to put any more resources into a new design other than just keeping it up and running. We will take a look at the homepage issue this summer as I agree, the columns there are quite stagnant but that's about the only planned improvements. I think when sending money PayPal (at least it did in the past) gives you an option to pay the fees or let the seller/person you are paying pay the fees. I think I recall that. Been a while. That said - I would not mind a discount for sending payment that way but, would ONLY do that with someone I know or have done business with before. I much prefer to just press the paypal button. But with make offer - I think the price would need to be updated after a price was agreed upon...before paypal button could be used. I did learn recently that if a seller sends you an invoice versus a money request - you will have the option to use your paypal credit 6 mos no interest option - and the fees to the seller are the same. Just in case you needed to finance a purchase interest free. Love this site, Less! I appreciate all that you and the moderators do. Wish the forums were as active as the old days though. That was fun. Thanks for the kind words FloweringEarth! 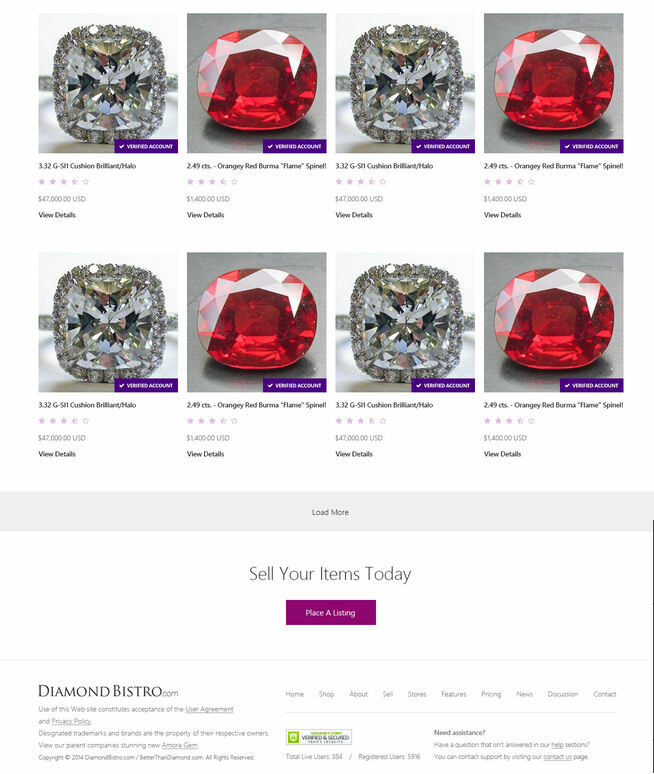 I am happy to see that Diamondbistro traffic is growing, so we're looking now at possibly updating it to be more mobile friendly, pinterest integrated,etc. So that may help improve a lot of the experience and see if that can help further boost it's growth. We'd likely have to triple the daily users (currently about 3K a day) to make it work based on the ad revenue, but I think the improvements might make that possible. And more users brings more users, so we'll see if a boost might put it onto a self-sustaining path. I am just wondering how DB is making money, I have sold 3 items and I don't recall ever paying a listing fee! I don't mind paying for a site I'm on nearly daily and $1 seems absolutely fair. Thanks for the kind feedback! DB isn't net making money overall, though I have hope we might in the future if we can grow traffic enough. We make some revenue from the ads that are shown on the site, so that's the only income from it right now and it's not enough to cover costs for now. For a while we did try going with a $1 fee, but the hope is that if we could get enough traffic flowing through, then we'd able to make it profitable in the future from a larger amount of ad views/clicks and keep it as a free listing site. (Also, the $1 ends up being only like .70c by the time we get it as Visa/MC charge a min 20 or 30 cent transaction fee plus their 3%, so it kind of felt pointless to end up losing so much of the $1). We're working now on more improvements to make the site better and easier to use, so hopefully that both improves the user experience and increases total users, which ultimately would let us remain free and ad supported. The popular listings column is now updated to only pull from the latest 3 months of listings,thus making it more dynamic and useful. We will be trying to fix the 'recently sold' items column next to also update each night so it no longer stays stagnant either. Thanks for the feedback on the homepage!